First off, next year will be 2010. Now, when you read that, did you say Two Thousand Ten? Get with the program, it’s read as Twenty Ten. That’s right, it’s been ten years now, no one’s gonna party like it’s 1999 anymore. Soon saying Two Thousand Ten will sound as antiquated as saying “gramophone”, “jitterbug”, or “music television”. And I don’t have time for extra syllables. It’s onward to Twenty Ten, to the future!! Now back to the 2010 Raleigh Record Ace, which for a bike of the near future looks a lot like a bike of the somewhat distant past. Lugged steel frame and fork. One nice feature of the bike is the 1-1/8” steerer. Just because you like the aesthetics and ride of a good steel road bike doesn’t mean you should be shackled to dead equipment standards. Oooooh, double tapered seatstays. Yeah, nice short point racing lugs, not the pansy scrollwork numbers that look like my Nana’s lace doilies. A bike built for riding, not coddling. 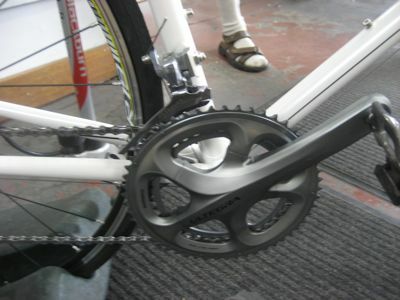 Also, check out the new Shimano Ultegra 6700 drivetrain and crankset. 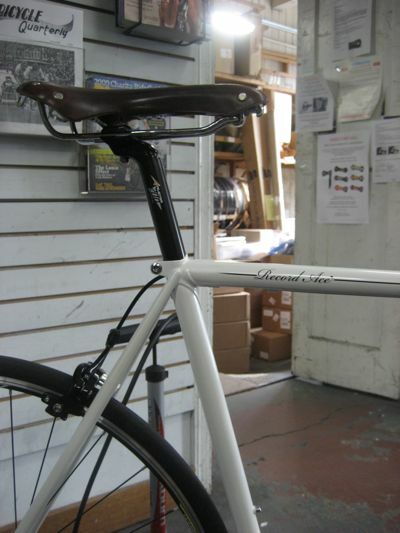 And the bike comes standard with a Brooks saddle too (if you’re into that kinda thing). To be honest, the wheels and brakes are obviously what allows Raleigh to control the price of the bike, but all the good and expensive Ultegra bits are present and accounted for. 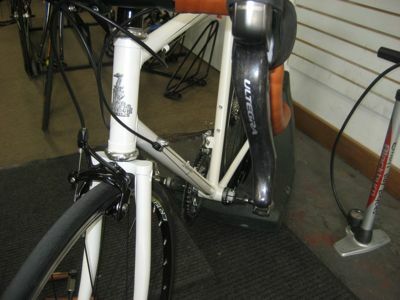 The bike was being ridden for the Raleigh catalog shoot, and it came into my shop for a quick adjustment. This seems like it’ll be a really hot bike next season. Previous Previous post: Ultregra 6700 in the Shop!